The North-East Monsoon has arrived! Just in time for our annual Trimaran Championships, which sees 5 Corsairs and 2 M23s vying for the 2018 Championship title. The fresh North-Easterly made it an easy 4 races for the fleet, but the end of day 1 also resulted in some equipment breakages for the teams. 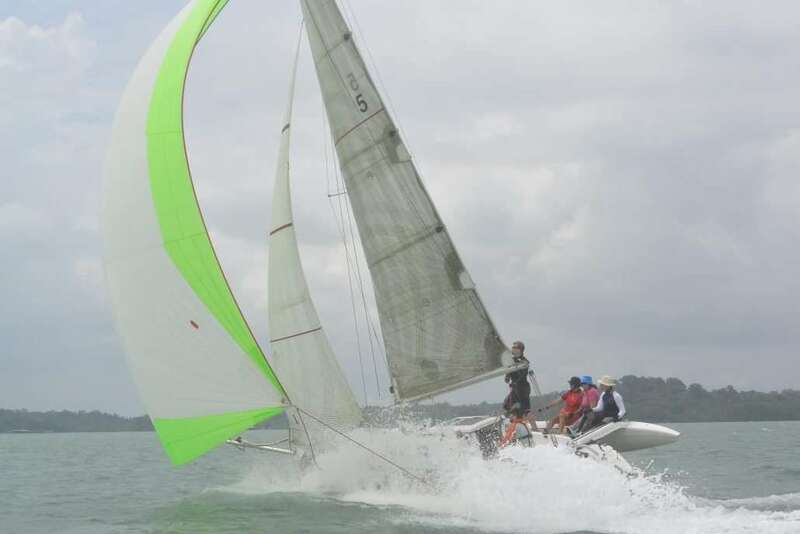 2 boats tie on 6 points to lead the fleet after 4 races – Kaze and DingHao. Both boths share 2 bullets each, and will be looking to pull away in the remaining 3 races. Heading the chasing pack, Witblits notched a consistent 3 3rd place finishes and a 4th to conclude the day in 3rd on 13 points. Baloo and Phoenix will have an uphill task of catching up with the fleet after some equipment malfunction, and look to claw their way back up on Day 2. Looking forward to racing and the Finale tomorrow! The North-East Monsoon continued to blow strong and true, easily gusting to 25 knots for Day 2. Baloo ended her campaign spectacularly – with a capsize during the first race for the day. Thankfully the rescue boats were quick to assist in uprighting the boat, and her skipper and crew escaped unscathed. Having blown their spinnaker to shreds yesterday, AbrakeDebra 2 sported a new kite in yesterday’s races, but struggled to keep up with the front-runners. The highly anticipated rivalry between Kaze and Ding Hao saw the former fizzle out, mustering a distant runner-up position for all of the remaining 3 races. Ding Hao’s dominant performance resulted in a deserving win for Scott McCook and crew, taking home the 2018 title. Witblits rounded up the podium finishers in 3rd. Congratulations to all winners and thank you for participating in the 2018 edition of our CSC Trimaran Championships! Good luck and fair winds to all CSC Members participating in the upcoming Neptune Regatta.